The answers are stored separately for each scale in the response table. 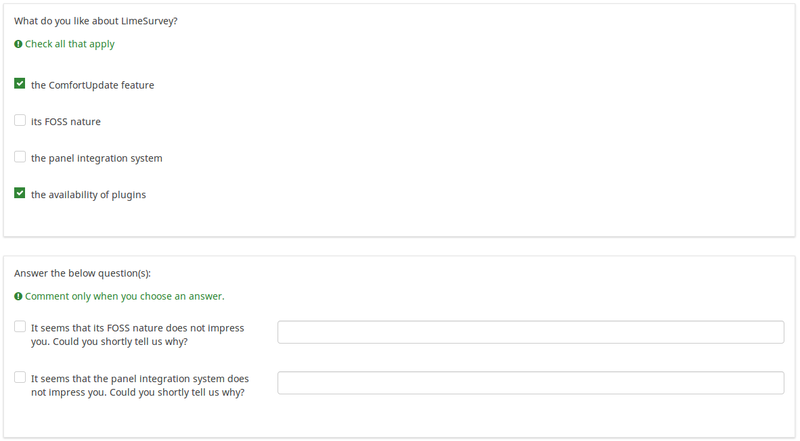 This option allows the survey administrators to request their respondents to answer to certain survey questions. If the mandatory questions are not answered, the respondents will not be able to proceed further. If you have a question with multiple subquestions and you require only certain subquestions to be answered, use the minimum answer attribute located under the Logic tab. If you use any of the preinstalled themes and the mandatory question attribute is enabled, a red asterisk will be shown next to the question. If you wish to hide it, please check these instructions. If the value of the relevance equation is "1" or "true", the question is "relevant" in the survey context, i.e. it is shown to the survey participant. If not, the question is hidden. Any survey question allows you to specify a relevance equation. This function is the successor of conditions and supports much more complex conditional logic. Whenever you save the relevance equation, it is evaluated and syntax-highlighted. Any errors will be color coded so that you can quickly detect and fix them. Hint: To check if all the relevance equations are used correctly within your survey, read about our show logic file feature. Here are good examples of syntax highlighting. 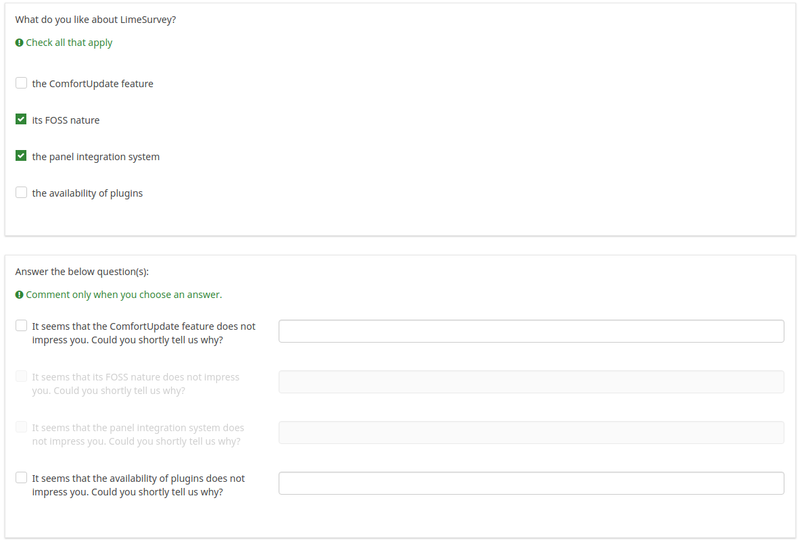 This attribute causes LimeSurvey to ignore the existing order of answer options/subquestions, and instead it orders them randomly. This option permits the survey creator to diminish the survey bias. Please note that if a question has subquestions, the order of subquestions will be randomized, not the order of the answer options. This is the text to be displayed above the first scale of answer options. This is the text to be displayed above the second scale of answer options. If this function is enabled, the answer options layout will use dropdown boxes instead of radio buttons. On - dropdown boxes are used. Off (default) - radio buttons are used. In the dual scale questions with the dropdown option enabled, if this attribute is set, the layout will use the provided text as a prefix and/or suffix before and after the dropdown input elements. The format is prefix|suffix. Suffix with the letters EUR: "|EUR"
Prefix with the letters USD: "USD|"
Both prefix and suffix: "USD|EUR"
In the dual scale questions with the dropdown option enabled, if this attribute is set, the layout will use the provided text as a separator between the dropdown boxes that correspond to each scale. Furthermore, each of these types of questions can filtered. This page was last edited on 19 April 2018, at 15:54.